I think, and I hope, you would agree that ANYTHING which controls and influences our choices other than Christ would stand accused by this scripture. 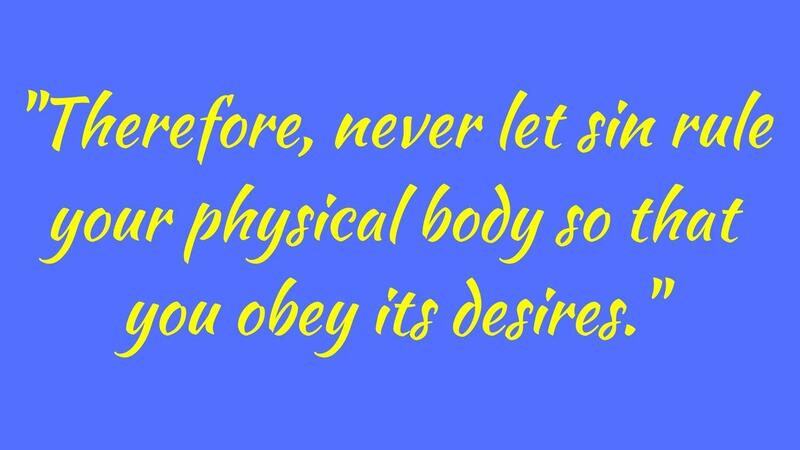 As believers, followers, and disciples of Christ it is He and He alone who should direct our daily choices; and this includes even how we care for our body. We have to look no further than our society, and this is even manifested within our church communities among our brothers and sisters, to see the physical effects of lives given over to the power of food, laziness, and apathy. How else can we explain the ever growing epidemic of overweight, obesity, and preventable disease we see? As Christians, it should be our intent to surrender all areas of our lives over to the influence of the Holy Spirit. If we are earnestly living this out, how is it then that we find ourselves suffering under the weight of poor health and physical limitations due to low energy and apathy toward the necessity of healthy lifestyle choices? For too long has the Christian community been arbitrary in it's application of what to surrender. We'll gladly speak on surrender of our spirit/heart, and even our finances to Christ, but why is our health and the care of our physical body so often left behind and discarded? Is it because it hits too close to how we self-comfort? Or maybe too close to what we feel brings up pleasure? Do we elevate the comfort and pleasure food, laziness, and apathy can bring above that which the Spirit of God can rest upon us? Perhaps we have allowed ourselves to be given over to the worldly comforts of food, drink, and movement avoidance more so than the spiritual comfort of Christ. If we sought the presence, influence, and healing of Christ perhaps our soul would be freed from the need of "comfort foods" and "t.v. therapy" and we'd more readily be able and willing to make choices which elevated our physical and mental state through better nutrition and regular movement. As believers, our process of surrender is continuous as is the process of sanctification. But, in order for us to be completely available for the indwelling presence of Christ to live out through us and for us to be fully ready to answer the call of God to serve, we must not withhold any area of our life and this includes our lifestyle choices. Our "walk" should represent the reality of the Kingdom in all ways, and the care of the body God has given us is a central part of that. *This is part of a Spiritually Speaking series that discusses the connection of relationship with God and its impact on how we care for our bodies. To see past posts in this series, click the links below.